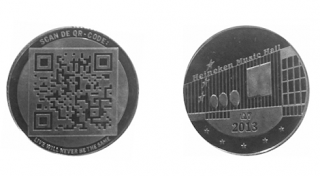 The tokens are used for purchases in the Heineken Music Hall. 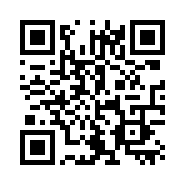 The QR Code itself is dynamic, making it possible to change the landing page after scanning. This can change from general information to a time limited (discount) offer. It is a creative way to combine a QR Code linked to a brand, since one side of the coin will show the companies logo and the other side the QR Code. The scan-ability of the QR Code from a photo was very poor, so I placed the actual code in this message for reference. I don't know if the resolution of the actual coin will result in fast scanning. The (temporary) offers that can be obtained by scanning can probably only be redeemed at the Heineken Music Hall. In that case it would be useful to use this code on posters and other printable material within the HMH as well. Looking at the link itself I would probably have shortened this link and selected a version 2 in stead of a version 3 QR Code for higher resolution. And being me, I would have checked it there was still a unused area to put a little graphic, like a (red) five point star, in the center of the QR Code. Will QR Codes Replace "www" ? QR Codes Placeholder for Viruses?